John Blodgett, vice-president of sales and marketing at MacKay and Co., identifies who holds a share of the aftermarket during a presentation at Heavy Duty Aftermarket Dialogue. LAS VEGAS, Nev. – The aftermarket serving Canada’s Class 6-8 trucks and trailers reached $4 billion in 2018, and the growth even took the analysts at MacKay and Co. by surprise. 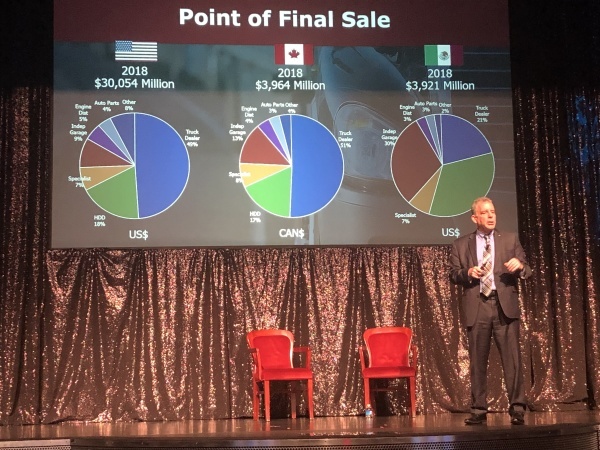 The market swelled 7.2% year over year when compared to the $3.7 billion recorded in 2017, said vice-president of sales and marketing John Blodgett, during a presentation at the annual Heavy Duty Aftermarket Dialogue. And the growth isn’t done yet. This year the analysts expect Canada’s heavy-duty aftermarket to enjoy a 4.1% compound annual growth rate (CAGR). This year parts prices are forecast to rise 2.1%, too. While under the 4.4% increases that preliminary results are suggesting for 2018, it’s still higher than the 1.2% recorded in 2017. The growth isn’t expected to end there. Current forecasts show a gradual growth to a $4.1-billion aftermarket this year — gaining about $200 million per year from 2020-2022. Even when the business levels out in 2023, the aftermarket is still expected to grow by $100 million on the year. Truck dealers are earning most of the Canadian business. Of the $3.964-billion pie available in 2018, they accounted for 51%. Heavy-duty distributors had 17% of the business, independent garages held 13%, specialists had 8%, engine distributors had 4%, and auto parts distributors had 3%. Other business models carved out 4%. Equipment growth hasn’t been limited to the aftermarket, of course. Class 8 sales were a clear leader in Canada, reaching 35,700 units in 2018 – up 29% over 2017. And this year MacKay and Company forecasts 36,800 such sales, projecting the market will dip 29% to 26,100 units in 2020. Canadians bought 11,100 Class 6/7 trucks in 2018, up 26% over the year before. But during 2019 that total is expected to drop 8% to 10,200 units, before dipping another 6% to 9,600 sales in 2020, the analysts add. The growth has not been limited to power units. The 49,500 trailers purchased in 2018 represents a 30% surge over the previous year. Although, Blodgett says that should be limited to a 3% increase in 2019, reaching 51,000 units on the year. By 2020, the trailer market is expected to drop to 36,100, representing a 28% plunge. Overall, Canada’s total vehicle population continues to grow. Last year there were 42,000 Class 6 trucks, 151,000 Class 7 trucks, 351,00 Class 8 trucks, and 553,000 trailers on the road. But the numbers are expected to dwindle slightly in the years to come. Totals in 2023 will dip to 35,000 in Class 6, 149,000 units in Class 7, 353,000 Class 8 trucks, and 552,000 trailers, MacKay and company projects.